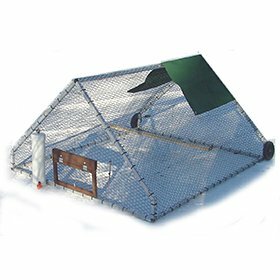 Keep rats, mice, and other pets away from your chicken coop, without having to use poison or empty yucky traps! 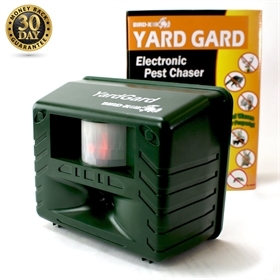 The "Yard Gard" works by emitting ultrasonic sound waves that irritate pest animals, forcing them to go elsewhere. 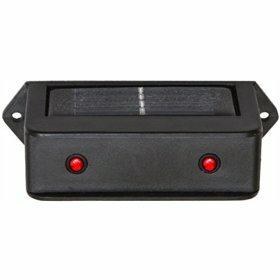 These sound waves are silent to humans, which means Yard Gard won't bother you or your neighbors. It's adjustable to target just the critters you most want to eliminate, including: deer, raccoons, cats, dogs, mice, wild pigs, squirrels and more. In order not to bother your chickens, point the Yard Gard away from your coop. Set it up just near your flock's enclosure, aimed into the rest of your yard. The signal will travel 45' forward, and about 30' across. We've added an option, above, to purchase a 4-pack for a special savings -- one for each corner of your coop or run! Want to keep chickens out of your garden? The Yard Gard works for that, too! The "pest dial" featured in the photo above should be turned all the way to the left; your motion sensory should be set to "constant" (so you should make sure to plug in the unit rather than run off batteries; this mode will drain batteries quickly! ), and the frequency should be set to "high." Your chickens won't want to go anywhere near it! Safely repels rodents, squirrels, deer, raccoons, feral cats, skunks, opossums, armadillos, rabbits, bats, wild pigs, & many more!